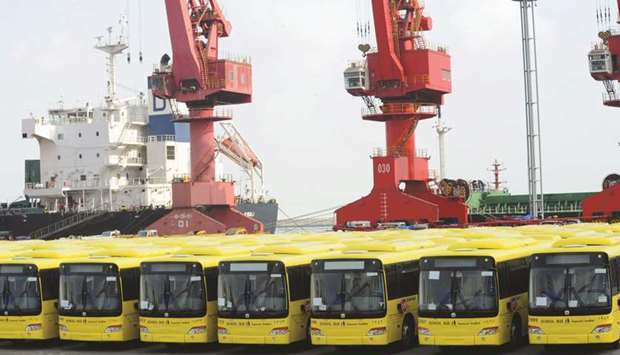 Buses wait to be exported in Lianyungang port. In comments in state media, Chinese President Xi Jinping said he hoped China and the United States would be able to promote a steady and healthy relationship, and that he was willing to meet US President Donald Trump in Argentina. US President Donald Trump and Chinese President Xi Jinping, who spoke by telephone on Thursday, expressed optimism about resolving their trade dispute ahead of a high-stakes meeting at the end of November in Argentina. But within hours of upbeat assessment, the US Justice Department took aim at another Chinese firm it accused of unfair practices, part of an across-the-board pressure campaign by the Trump administration targeting China. Still, investors cheered the resumption of dialogue and a report that Trump was taking steps to resolve the tariff war, with shares in Asia hitting three-week highs yesterday and the dollar softening. Trump said on Twitter that trade discussions with China were “moving along nicely,” and that he planned to meet Xi on the sidelines of a G20 summit, in Argentina, after the two had a “very good” phone discussion. Bloomberg, citing people familiar with the matter, later reported that Trump wants to reach a trade agreement with China at the G20 meeting and that after the call with Xi, he had asked officials to begin drafting possible terms. The news agency said it was not clear if Trump was easing up on demands that China has resisted, and it cited one person as saying intellectual property theft was a sticking point on a possible deal. In comments in state media, Xi said he hoped China and the United States would be able to promote a steady and healthy relationship, and that he was willing to meet Trump in Argentina. “The two countries’ trade teams should strengthen contact and conduct consultations on issues of concern to both sides, and promote a plan that both can accept to reach a consensus on the China-US trade issue,” Xi said on CCTV state television. Xi was quoted as saying after the call with Trump that they had hoped to expand trade co-operation. Neither leader specified any details of possible progress in their first known direct discussion in several months. Trump administration officials have said that trade talks with China cannot resume until it comes up with specific actions it is willing take to meet US demands for sweeping changes to policies on technology transfers, industrial subsidies and market access. The two countries have imposed tariffs on hundreds of billions of dollars of each other’s goods and Trump has threatened to put tariffs on the remainder of China’s $500bn-plus exports to the United States if the disputes cannot be resolved. Jacob Parker, vice president of China operations at the US-China Business Council in Beijing, said there were plenty of challenges that would require significant negotiations in advance of a meeting between Trump and Xi to ensure success. “What negotiations have lacked to date has been that (presidential) level of engagement. If President Trump makes an agreement with President Xi, there is nobody above them to overturn it,” he said. “We’re optimistic this is a potential off-ramp of increasingly antagonistic trade tensions and hope it leads to a pause and new negotiations,” he said. Tu Xinquan, a trade expert at Beijing’s University of International Business and Economics, said he was sceptical that the Trump administration was truly ready to deal, and that other factors, such as the mid-term congressional elections, could be driving statements from the administration. “The best situation (from a Trump-Xi meeting) would be no further actions, temporarily. But the tariffs already imposed will not go away,” Tu said. Just after the upbeat readouts of the Trump-Xi call, the Justice Department announced the latest in a list of actions against what the Trump administration calls China’s cheating through intellectual property theft, unfair corporate subsidies and rules hampering US corporations in China. A Justice Department indictment targeted two companies based in China and Taiwan and three individuals, saying they conspired to steal trade secrets from US semiconductor company Micron Technology Inc. This week, prosecutors announced an indictment against 10 defendants, including two Chinese intelligence officers and other computer hackers and co-conspirators, who are all accused of breaking into American company computers to steal data on a turbo fan engine used in commercial jetliners. On Wednesday, US Secretary of State Mike Pompeo said China was probably Washington’s biggest long-term security challenge and the United States was engaged in a “multi-pronged effort... to convince China to behave like a normal nation on commerce” and respect international law. But Trump struck a more affable tone on Twitter after the phone call with Xi. “Just had a long and very good conversation with President Xi Jinping of China. We talked about many subjects, with a heavy emphasis on Trade,” Trump tweeted. “Those discussions are moving along nicely with meetings being scheduled at the G-20 in Argentina. Also had good discussion on North Korea!” Earlier this week, Trump said he thought there would be “a great deal” with China on trade, but warned that he had billions of dollars worth of new tariffs ready to go if a deal did not materialise.